We are authorised distributors of PROMOTECH Fillet Welding Carriages which include all product range as mention below. Our patrons can depend on LIZARD - Programmable Fillet Welding Carriage for uniform welds of supreme quality. 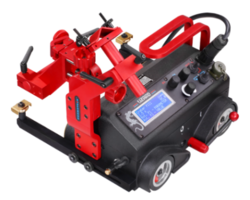 It can be programmed for continuous or stitch modes of welding and offers wide choice of welding patterns as well as parameters. It has a vital feature of oscillation attachment that facilitates automatic identification of connection to configure matching operating modes. This feature enhances its functionality.